Jamit Job Board - The ultimate Job Board Software for niche job boards. Written in PHP and using the MySQL database for speed. Feature packed, skinnable, localizable and extendable. Web based configuration of forms. You can add custom fields without the need for custom programming - including text fields, check-boxes, select lists, multiple selects, text editor, HTML editor, a YouTube video fields, date & calendar fields, category fields and many other types of fields! Customize search boxes via a web interface, no programming needed! Change any word / sentence / paragraph of the site through a web based interface, never touch any code! Translatable to your language. Edit email templates to your preference, just the way you like it. Change the look and feel - The job board is fully skinnable through a lightweight theme system. Customizable templates and CSS, see the Theme Customization manual & video for more details. Edit many other settings, including prices, currencies, time zone, categories, and more. Anonymous Resumes - Job seekers can set their resume to \'anonymous\' so that their contact details are visible only to employers who they approve. You can configure which fields are to be \'anonymous\'. Blocked Resume Fields - Block some fields on the resume list, to be shown to only your paid subscribers! Member Only Fields - If needed, you can set some fields to be viewable by members only (posting form & resume form). Start earning revenue immediately! Bill for posts / subscriptions / memberships, or set it free & earn advertising revenue from Google AdSense and others. Support for search engine friendly URLs (Mod Rewrite) and XML Sitemaps. Automated sending of Job Alerts & Resume Alerts, RSS feeds (latest jobs & per category), Newsletter. Open source. Full source code included, not encrypted. 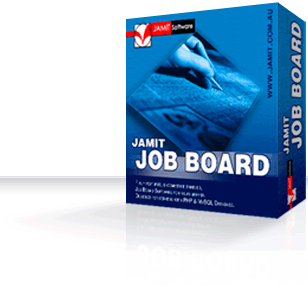 Jamit Job Board features a powerful plugin system for extending the features of the job board. Some of the most useful plugins are offered free of charge (as a separate download). InfoPages: A simple yet powerful content management system (CMS) for adding new pages to your job board. Includes a contact form feature. Indeed XML Backfill: Use this plugin to back-fill your job board with jobs from Indeed.com - and earn extra revenue too! For many other plugins, please refer to our complete Plugin List. Here are some essential links to help you get familiar with our software. However if you have a question or enquiry please do not hesitate to contact us directly. License: The job board is open source, distributed under the Mozilla Public License.